Ritually in August, Europeans repair to their mountains or beaches while tourists throng their cities. 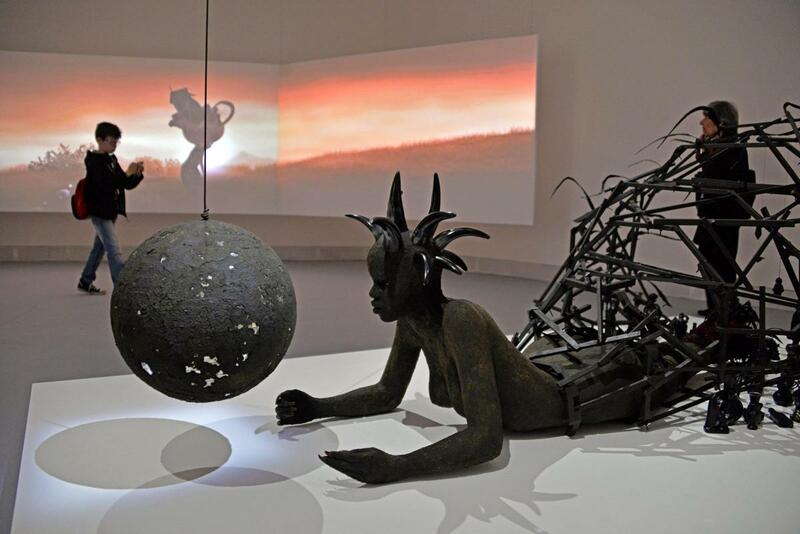 But by early July, the 2015 Venice Biennale, already darkly apocalyptic, was also featuring the 110-degree afternoons of global warming. Completely flattened, we fled to the Dolomites, whose snowy peaks are still visible from Venice on very clear days. 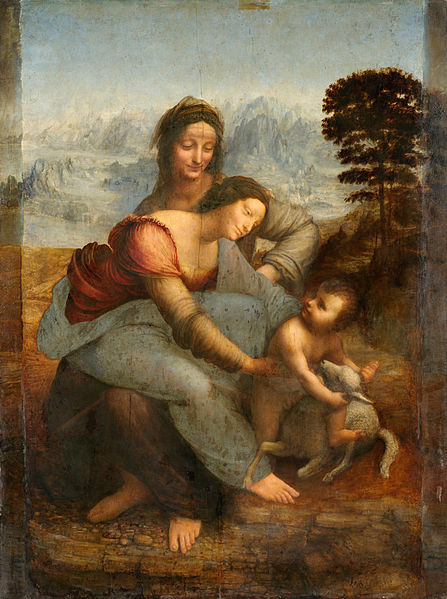 The Dolomites are seen in the background of paintings by Venetian masters, and by northern painters whose horizons lacked mountains. 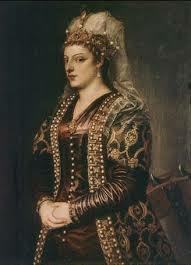 Titian, raised in the Dolomites, painted a portrait of Catarina Cornaro, queen of Cyprus (and, some say, of Armenia). 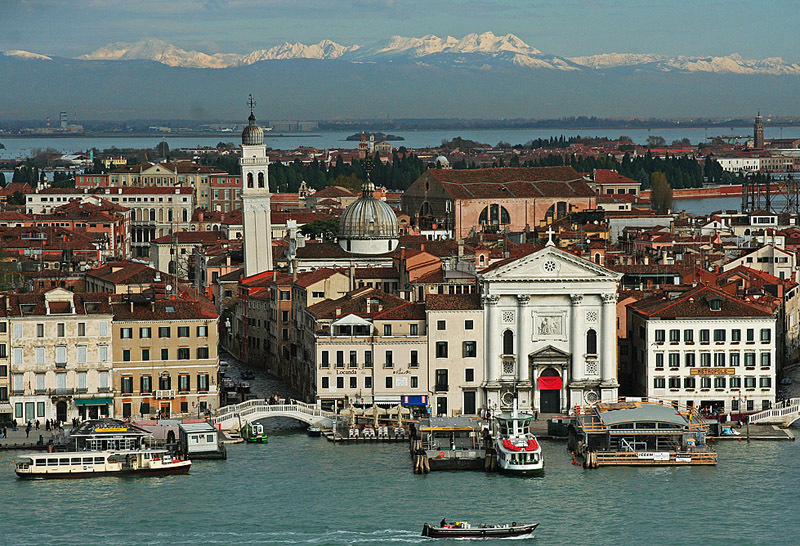 Catarina was forced to abdicate and cede her country to the Republic of Venice. 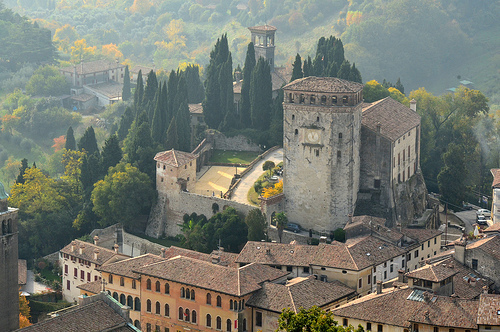 She was allowed to keep her title and given a castled court in Asolo, safely removed from the circles of power. Titian decks her out in the Turkish-style brocade coat which complimented the generous curves of so many Venetian ladies. Any soprano in Donizetti’s Caterina Cornaro would be likely to wear it, but since the opera was booed at its 1844 opening in Naples, it has seldom been staged. A pair of smoky-skinned youths, toting racks of colored beads, took a table next to us in a café next to the bus stop in Corvara. Here we were, merely escaping a heat wave. How had they made their way so far up into these mountains? Had it occurred to them that a resort town might have less competition and wealthier customers than a crowded city? What to make of the lush green valleys and flowing waterfalls of this alpine paradise? Probably they were en route to Germany, more or less as the crow flies—or according to a Google map. Germany we are told, expects to receive 800,000 refugees next year. Meanwhile, the presidents of the Veneto and Lombardy had just ordered towns in their regions to stop accepting migrants altogether. Six thousand refugees had been rescued from the Mediterranean in the previous weekend, and many thousands more waited to embark from Libya and Turkey. Renzi and his government in Rome counseled Italians to be humane and accept the migrants across the board. No way, said Luca Zaia, regional president of the Veneto.The situation “is like a bomb ready to go off.” Roberto Maroni, president of Lombardy and former leader of the conservative Lega Nord, threatened to cut the funding of any compassionate municipalities who encouraged refugees to settle. 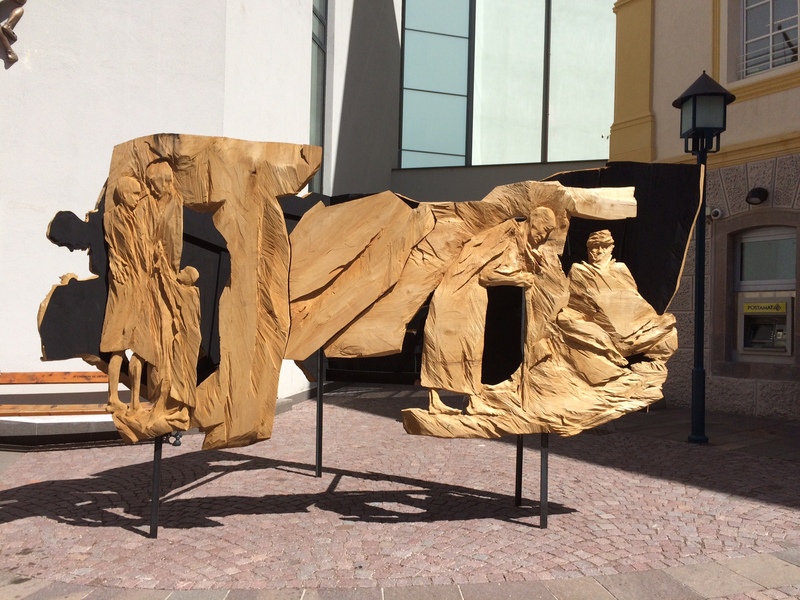 Further on, the street opened onto a large , quite affecting monument by Armin Grunt (umlaut u) depicting the miseries of migration. Woodworking was and remains the major art and craft in these forested mountains. But tourism became the mainstay of their economy in the last century, increasing after the famous Winter Olympics of 1956 took place in Cortina d’Ampezzo. This year, the 56th Venice Biennale, the world’s most famous art event, manages to condemn not only climate change, capitalist exploitation of labor and industrial pollution, but global starvation, planetary degradation, and the arms trade—in just two gulps, one at the Arsenale site and the other at the Giardini. Actually, the Golden Lion prize for the best national exhibit went to Armenia, outliers on the monastery island of San Lazzaro, marking the centennial of their genocide and diaspora. We happened to go to the island on a Sunday afternoon, and found ourselves caught in a line moving relentlessly into the church for the Orthodox mass, nearly two hours long. It is sometimes said that art art can take you anywhere, and this year’s Biennale does compel you to visit unlikely places, from the assembly line of a cultivated pearl factory to gay brothels in Chile. Many of the heavily didactic exhibits are of videos and photos, with displays of significant documents, such as international agreements repeatedly dishonored, or newspaper clips with false information, or contracts you make with yourself. The Australian Fiona Hall is more direct. 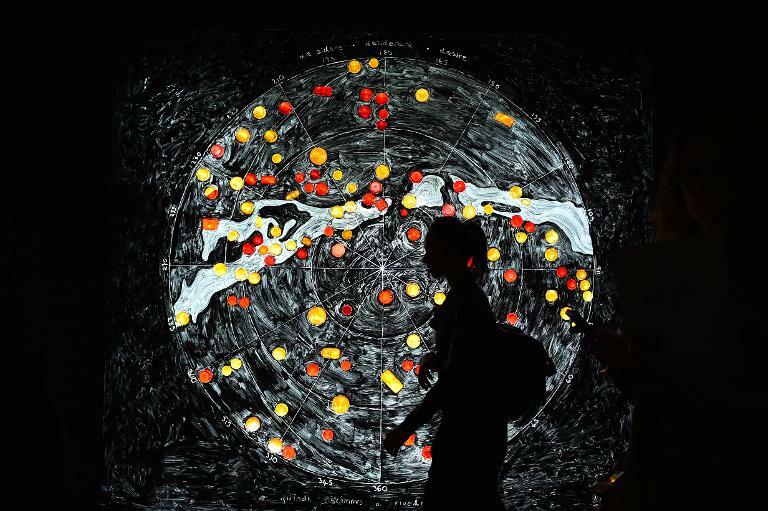 Her imaginative work fills the whole pavilion and includes a 3-D map of the southern Mediterranean scattered with tiny figures, indicating the migrants who drowned in one week between Africa and Italy. Other artworks have related messages. Although there is plenty of irony, subtlety and ambivalence are not qualities that many of these artists value. They are desperately concerned for the future of their own countries and the world at large. Still, their Biennale appearances are financed by capitalist networks that certainly include artists’ galleries, and most of the work, in case you were wondering, is for sale. 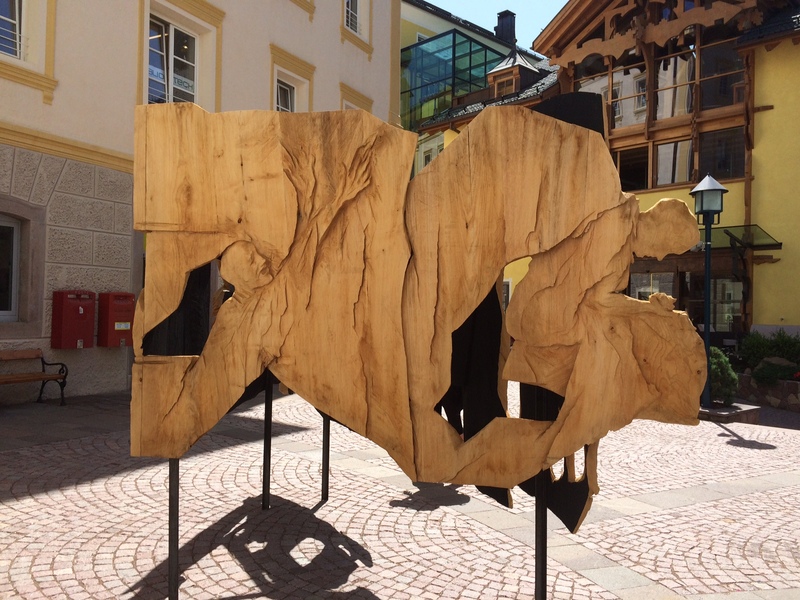 Alongside the galleries in the Dolomites that show woodworking artists, are regional museums focusing on alpinism (mountaineering) and local history, including that of the so-called White War. At almost eleven thousand feet, Marmolada is one of the highest peaks in the Dolomites. 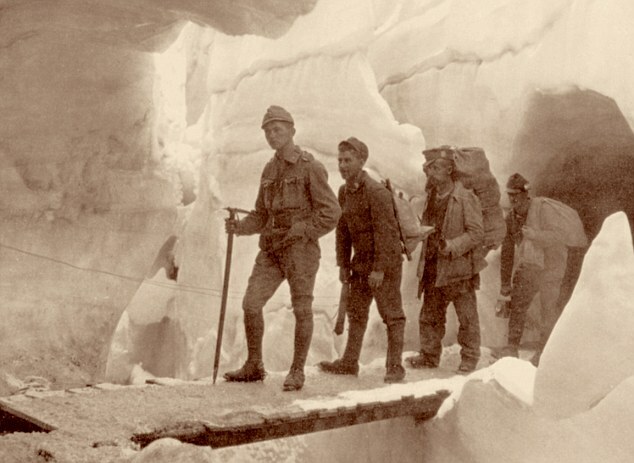 During World War I, as one military front shifted into South Tyrol, Austrian troops tunneled into Marmolada’s northern glacier and the Italians into its rocky southern face. Somehow they made it possible–building roads, dormitories, and gun emplacements–f0r thousands of soldiers to exist, and to fight, in the brutal cold at altitudes where only mountaineers and shepherds had ever ventured. A hundred years later, in our warming world, the icy slopes are melting to reveal grim relics—soldiers’ corpses and rusted armaments. Some 150,000 men died in the White War, only a third of them in battle, the majority from avalanches, frostbite, and other effects of the extreme cold. Likely, in warmer decades to come, spring skiers will continue to make grisly discoveries in the Dolomites. Partly as a result of the White War, in 1919 South Tyrol was given to Italy, and those 150,000 Austrian and Italian soldiers died in a struggle over national/imperial hegemony that their sons and grandsons have mostly disavowed. In the mountains, what they worry about now is climate change, whether they will have snow for the ski crowds, or whether they will have to depend on the snow cannons. Down on the flatlands, they are worried about new waves of migrants, most of whom have paid their last thousand euros to find asylum or at least work and food in the West. Few saw just how fragile and flammable the Middle East would prove, how quickly the drying up of the Sahara, the continuation of brutal governments, the series of drought years, and the internal wars would displace millions. The tens of thousands of refugees spilling into Germany, Italy, and France from the Middle East, Eastern Europe, and Africa are economic and sometimes political refugees. Their lives and their families’ lives are on the line when the cost of passage on a leaky raft or rusty ship. They’re fleeing, most often they know not where. In America the flaming issue of next year’s presidential election has become immigration, from Mexico. In Hungary a far-right government constructs a fence to stop the influx of refugees arriving from Serbia, Macedonia, Greece. A Hungarian friend says that the brutally anti-migrant stance of his government is secretly admired by leaders of the European union. Whatever the case, Germany is in ever in a bind to show that its past inhumanity was an aberration. But Germany by itself cannot absorb these millions. A year ago I tried to chart some of the tragedy of Syria since the civil war began. The latest chapters include demolition of another temple in Palmyra, and the changing route of Syrian refugees: they are now travelling north to the Arctic Circle and heading for the Norwegian border, to the little town of Kirkenes, 2500 miles from Damascus. Norway has nothing to prove about its humanitarian history, and welcomes them. By Frances Smith Starn in Uncategorized on August 28, 2015 . While slothful old me continues to spend most of his time reading thrillers,you travel the world and do all sorts of interesting stuff.But in one respect I am following your example:for the last six months or so I have been teaching English conversation in a local library to new immigrants. 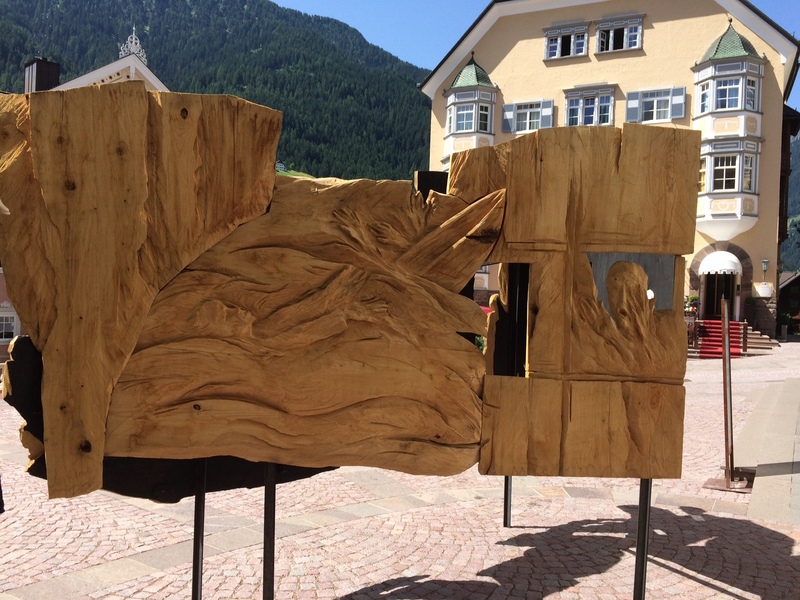 Thanks, Frances, for your tour of the Dolomites, its art and history! nice. only quibble, toward the bottom: ‘ In Hungary a far-right government constructs a fence to stop the influx of refugees arriving from Serbia, Macedonia, Greece.’ this makes it sound as if refugees come from the balkans instead of m.east and africa. how did the hungarians like it?